Researchers: Rhett Butler and L. Neil Frazer, University of Hawaii, Manoa; and William J. Templeton, Portland State University. Estimates of the probabilities of a magnitude greater than 9.0 earthquake for the Aleutian Islands are about 6.5 to 12 percent over the next 50 years. Such an event poses obvious earthquake and tsunami risks for Alaska and tsunami risks for western North America and Hawaii. These estimates were derived by considering past 9.0+ events along major subduction zones and the rate of motion per year along these converging plate boundaries. There have been five Mw 9.0+ earthquakes since 1900, including the 1952 Kamchatka Mw9.0, the 1960 Chile Mw 9.5, the 1964 Alaska Mw9.2, the 2004 Sumatra-Andaman Mw 9.3 and the 2011 Tohoku Mw 9.1 events. All of these events occurred as shallow megathrust earthquakes along subduction zones and generated large tsunamis. In each region — though to varying degrees — there is a rock record of past mega-earthquakes, providing a history of the earthquake rate in the region. Here the authors estimate the global rate of Mw 9.0+ earthquakes and then distribute the global rate over the different subduction zones to estimate a regional rate. For each region, they use the relative convergence rate per year using the UNAVCO plate motion calculator with the MORVEL 2010 model of DeMets et al. 2010 to determine the regional rates. These models are based on geodetic data, estimated plate motions and recorded earthquake ruptures. This regional rate is compared to regional rates estimated from the rock record to determine the accuracy of the extrapolation. 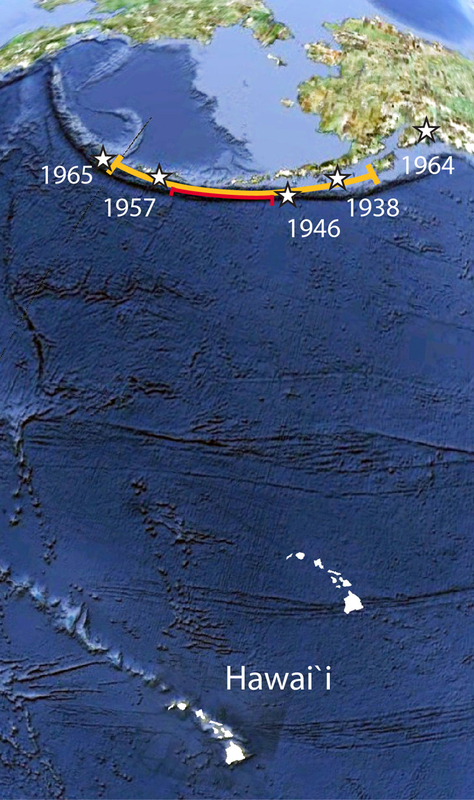 Finally a regional rate for the Aleutian Islands is estimated to determine mega-earthquake probabilities there, especially for events that are most likely to generate a tsunami directed towards the Hawaiian Islands. 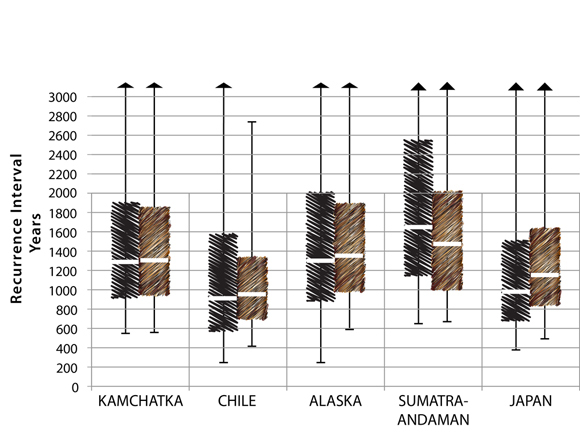 The regional rates estimated from the model are comparable to the regional rates estimated from the rock record. Therefore it is possible to use the regionally scaled global rate method to estimate the earthquake rate for the Aleutian Islands where there is a limited rock record of past events. 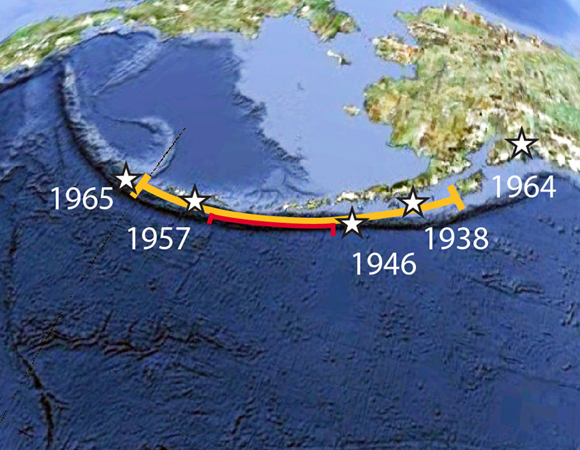 There is a 6.5 to 12 percent chance over the next 50 years of a Mw 9.0+ event in the Aleutians, leading to major risks for Alaska, western North America and Hawaii. The annualized risk for Hawaii is about $30 million. Butler, R., L. N. Frazer, and W. J. Templeton (2016), Bayesian probabilities for Mw 9.0+ earthquakes in the Aleutian Islands from a regionally scaled global rate, J. Geophys. Res. Solid Earth, 121, 3586–3608, doi:10.1002/2016JB012861.